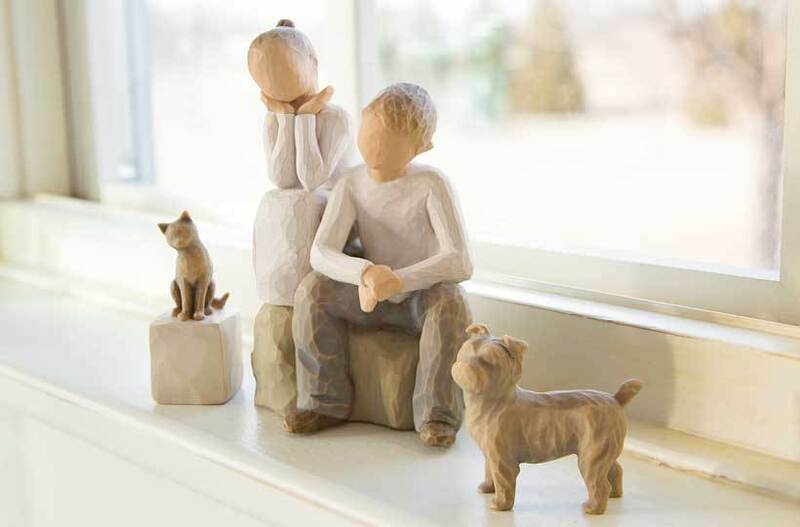 A Willow Tree for every age… a Willow Tree for every stage… Father and child figurines are reminders of important milestones in every father's life. Any of these pieces would be meaningful gifts to celebrate the love between parent and child. Willow Tree figures of father and daughter, and father and son, reveal the special relationships that both daughters and sons have with their dads. In the figure, My Girls, a father looks on with pride and wonder as his daughters' personalities emerge. The daughters look to their father for stability and reassurance. This piece can be viewed from either perspective, making it an equally meaningful gift for fathers or daughters. In That's my Dad, a father playfully wrestles with his son, at his level, happy to just be spending time together. A wonderful Father's Day or birthday gift for Dad, these figurines capture a moment in time and preserve memories.